In a 1970 contest to design a symbol for recycling products, college student Gary Anderson created a simple triangular logo. His design is now a universally recognized symbol of products that are recyclable or made of recycled content. There are dozens of variants of this image worldwide, but the examples below show the recycling symbols that are most common in the United States. This is the most common form of the symbol and is found on products like plastics, paper, metals and other material that can be recycled. 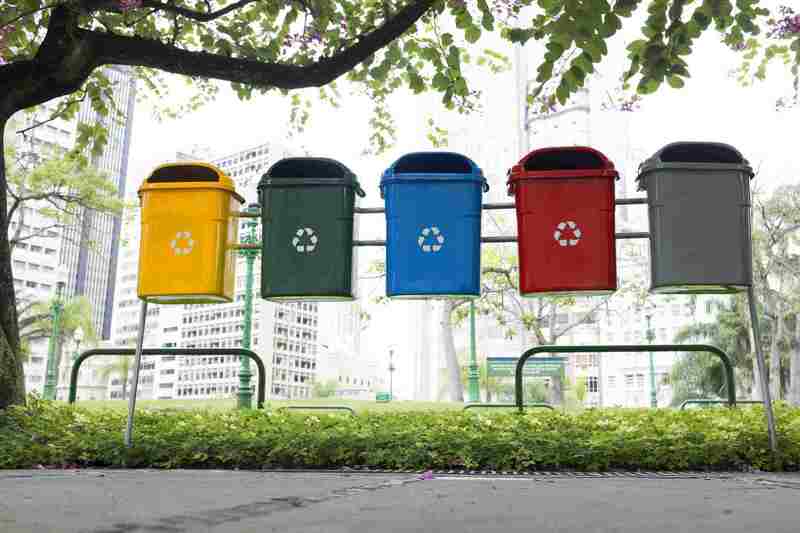 It's also seen, in many different styles, on recycling containers, at recycling centers, and anywhere there's an accent on smart use of materials and products. When the three arrows surround a number, that indicates the material is a type of plastic resin that can be recycled. But plastic recycling is a little tricky since seven different kinds of recyclable plastics carry this symbol (polyethylene terephthalate, polystyrene, low-density polyethylene, etc. ), and each can be reused in some way. Not all recycling programs will accept all types of plastic, however, so check with your local program before tossing any plastics into a recycling bin. There are a handful of symbols for aluminum recycling and recycled aluminum; in addition to the symbol shown here, there's also a configuration of two curved arrows surrounding the letters "alu." Aluminum recycling is one of the environmental movement's great success stories -- in many places, over 95 percent of all aluminum is recycled. A circle around three arrows means the product is made of recycled material; it's usually found on paper and cardboard. How much recycled material the product contains is sometimes indicated by a percentage inside the arrows. In other cases, black arrows on a white background indicate that the product is made of a combination of new and recycled content, and white on black means it's 100 percent recycled. The symbols above are not trademarked and can be adapted or used by anyone, as long as they don't violate the Federal Trade Commission's rules for environmental marketing claims. The symbols below, however, were developed by industry groups for specific uses. Developed by the Glass Packaging Institute, this symbol is widely used to encourage glass recycling. Even glass that doesn't have this symbol, however, can usually be considered recyclable if it's from a clean food or drink container. The Recycled Paperboard Alliance uses this symbol to showcase paperboard that contains 100% recycled content. It's often seen on packaging like cereal boxes. The amount of recycled paperboard that came from consumer sources (as opposed to industrial sources) is indicated below the symbol. Corrugated cardboard that can be recycled is indicated by this symbol, developed by the folks at the Corrugated Packaging Council. Not all corrugated packaging can be recycled; for example, if corrugated packaging is coated with wax or another substance, it might not be accepted for recycling and will usually not carry this label.